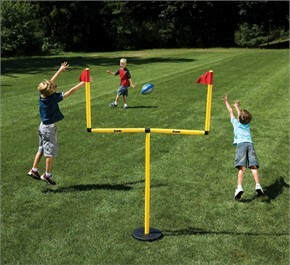 The Youth Football Goal Post Set is one of the coolest outdoor toys that kids will love to use! Instead of simply watching a football game on television, football equipment for kids such as this Franklin Sports youth football goal post set allows children to take part in the action. Specifically, this youth football equipment consists of a football goal post, a kicking tee, one mini football and an air pump to revive the kids football when it goes flat. With this kids football gear the fun never comes to an end! For ages 5 and up. Availability: The Youth Football Goal Post Set ships within approximately 1 business day.